Get.desk2opapps.com is a server which hosts advertising-related files and information. It has been found that this server can provide you with bundled installers, which you are provided with after clicking on a pop-up advertisement. Pop-up ads are usually displayed by adware programs, so if you have already been taken to Get.desk2opapps.com, it is very likely that your Internet browsers are affected by some adware program. 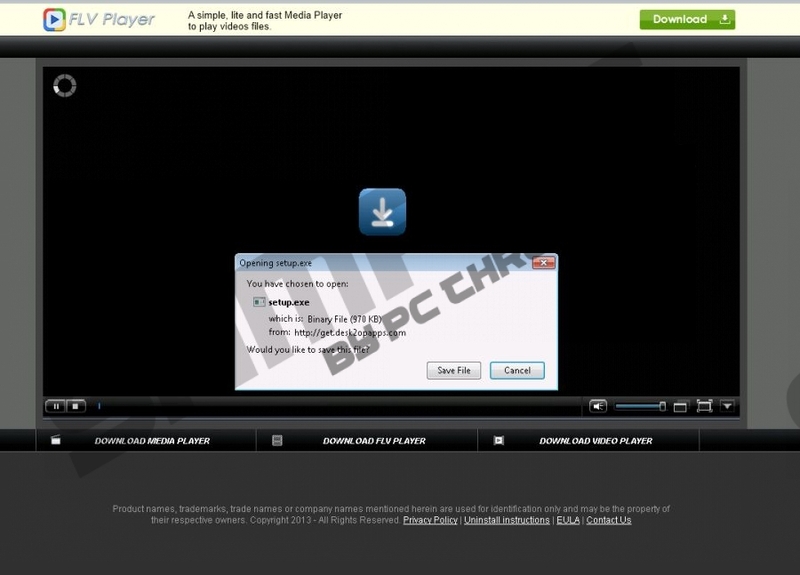 You can be taken to Get.desk2opapps.com by a pop-up warning that recommends downloading FLV Player or Flash Player; however, instead of the program advertised you are provided with several potentially unwanted programs and adware programs. This method of spyware distribution is very common, and most of the times, instead of a program presented in an advertisement, the user is asked to install a completely different software program. During the analysis of Get.desk2opapps.com, it has been found that the setup file provided by the server is published by Outbrowse. Outbrowse works as both a publisher and an advertiser. Outbrowse distributes third parties’ software so that the owners of the software programs can drive more traffic to their websites and raise their revenues. Outbrowse.com offers Mixi.Dj, a program that allows users to create music playlist and share them with friends; Face & Chat, which is a messenger software program; and Revenyou, which is a monetization platform that bundle software programs with other applications. The installer that you are provided with at Get.desk2opapps.com should be disregarded because it may cause you a lot of trouble. If you do not want to receive new advertisements or recommendations to activate some system optimization tool, do not even think of installing the programs provided. If you want to update Adobe Flash Player, an Internet browser or some other application, use the updates provided on the official websites of the applications. Third party software distributors are usually not authorized by the developers of the applications that you are encouraged to update, so ignore their recommendations and leave the page associated with Get.desk2opapps.com in order to prevent unreliable programs. Get.desk2opapps.com can be used by numerous adware programs, and, if you want to find out whether the adware program that you have on the PC has its uninstaller, use our instructions provided below. If you manage to uninstall the undesirable program, bear in mind that some of the files related to the application may still be present on the PC. Hence, we recommend that you rely on a powerful spyware removal. More specifically, we recommend using SpyHunter because it can easily detect and delete malicious files and also safeguard the system against different types of computer threats. After uninstalling the adware program, you should scan the system to make sure that no browser cookies and other unnecessary files are present within the system. You can easily do so with the scanner available below. Click the download button, download and install the application and launch a system scan. Quick & tested solution for Get.desk2opapps.com removal.